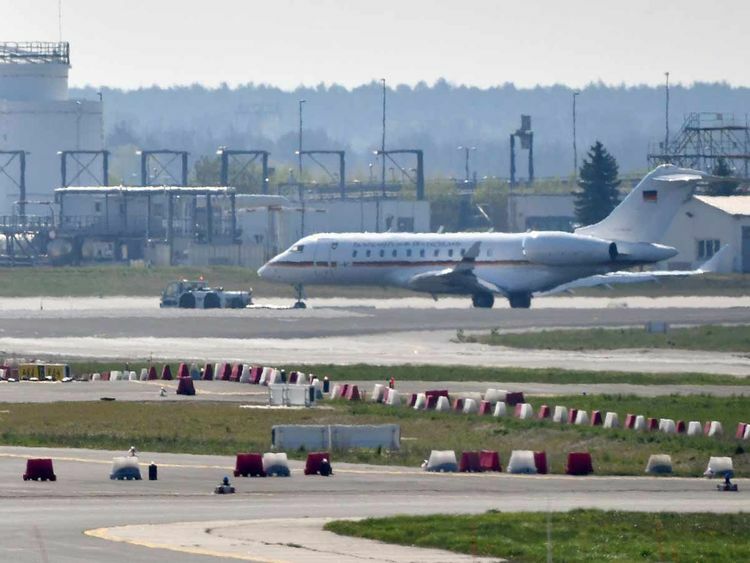 BERLIN: A German government plane crash-landed on Tuesday, briefly disrupting traffic at Berlin's Schoenefeld airport, in the latest of a series of technical faults to plague the official fleet. No passengers were onboard the Luftwaffe's Global 5000 jet, but the crew was being examined by doctors for injuries, a spokesman for the airforce told AFP. The aircraft experienced technical problems soon after takeoff and then had serious trouble landing at the Berlin airport. "The aircraft took off from Schoenefeld for a so-called functional flight, which takes place regularly after maintenance work, and during the flight, there was a malfunction, forcing the aircraft to turn back," said the spokesman. "The jet touched the ground with both wings and a controlled landing was no longer possible." The runway was briefly closed while the plane was towed away, leading to the disruption of dozens of flights. After the incident, Schoenefeld announced at 0730 GMT that flight schedules had been suspended and approaching planes were diverted to Berlin's other airport, Tegel, northwest of the city centre. The airport was open again by 1000 GMT, but Berlin Airport Services tweeted "delays may still occur". The incident is the latest in a string of mishaps suffered by the government's fleet of aircraft in the last months. German Chancellor Angela Merkel missed the beginning of a G20 summit in Buenos Aires last November as the plane carrying her from Berlin encountered electrical problems and was forced to land in Cologne. The "Konrad Adenauer" Airbus A340 was given a complete overhaul following the incident but on its first outing since, on April 1, it blew a tyre on landing in New York with Foreign Minister Heiko Maas on board. The plane eventually had to be towed to its parking space, but the delay meant that Maas missed his first appointments at the UN. In March, the foreign minister was stranded in Mali due to a hydraulic problem with his Airbus A319's landing gear. The plane woes have also hit other top German officials. At the end of January, President Frank-Walter Steinmeier was stuck in Ethiopia for similar reasons while Development Minister Gerd Mueller had to cancel a trip to Namibia at the start of the year owing to problems with his plane. With the Konrad Adenauer back in the repair workshop, Finance Minister Olaf Scholz recently had to fly on a smaller plane, the A321, which required mid-route refuelling in Iceland to complete its journey to the United States. In response to the defects, the German government announced last week they are paying 1.2 billion euros ($1.3 billion) to buy three new Airbus A350s planes, the first of which will be delivered in 2020.